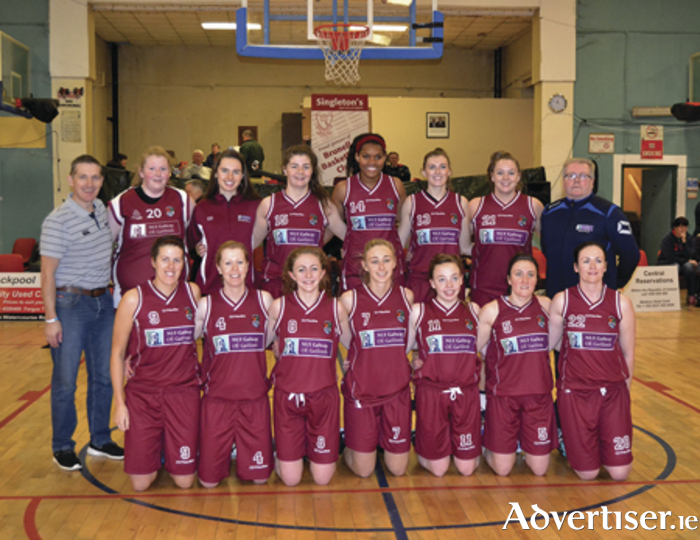 NUIG Mystics: Back row, Mike Murray (coach), Rebecca Hansberry, Catherine Connaire, Leah Cunningham, Marritta Gillchreese, Lauren Murray, Hannah Coen, Terry Kennedy (asst coach). Front row, Michelle Fahy, Siobhan Kilkenny, Emer Smyth, Deirdre O'Shea, Sarah Grealish, Ailish O'Reilly, Suzanne McDonagh. Three Galway teams have booked their places in Basketball Ireland cup finals after the Hula Hoops National Cup semi-finals took place in Cork over the weekend . Maree’s senior men’s side has made it through to the President’s National Cup final, NUIG Mystics booked their place in the Senior Women’s National Cup final, and Moycullen are through to the U18 Men’s National Cup decider. There were also defeats for Maree's U18 men's team and Moycullen at U20 men’s level. In the dying seconds Maree managed to hold on to secure their place in the final, overcoming Fr Matthews by 84-80. “We were 10 or 12 points up near the end and we should have been able to keep that lead, but in fairness to them, they came back into the game well and it really made it a nail-biting finish," said Maree head coach, John Finn. The Cork side produced a 6-0 run before Maree found the target, and scores from Maree’s Paulius Peldzius, Kenneth Hansberry and Cathal Finn matched those at the other end by Sean Cantwell and Paul O’Driscoll to leave the game neck and neck. Maree were in front following a fantastic steal from Burkea and uncontested lay-up, but Cantwell replied, and with fantastic rebounding from Barry Denieffe, Fr Mathews had the edge at half time, 35-32. Despite a fight back from Fr Mathews, Maree hit a 12-0 scoring spree with brilliant shooting from Cathal Finn and Peldzius, combined with fantastic offensive rebounding from Colm O’Hagan, to see them finish out the quarter 63-51 ahead. Maree continued to dominate the early exchanges of the fourth quarter, with Hansberry, Finn and Peldzius hitting the target. They had soon opened up a 16-point lead, but Fr Mathews, through Cantwell, McGinn and the brilliant Owen Connelly, launched a comeback, closing the margin to four to ensure a tense finish. A well-taken shot under pressure from Barry Denieffe with just 30 seconds on the clock put just two between the sides and, with time running out, it was Cantwell who stepped up to the free-throw line. Unfortunately for Fr Mathews, he did not convert and instead, Enda Walsh had the last say of the game from the opposite free-throw line, netting both of his shots to win the game 84-80. Moycullen launched the comeback of the day when they secured a phenomenal win over Tolka Rovers in overtime to book their spot in the Hula Hoops U18 Men’s National Cup final. “I’m absolutely thrilled," said Moycullen coach John Cunningham. "These guys have so much heart. We’ve played so much basketball this year to get to this position that we knew that if we could be within a couple of points we would know how to win." Moycullen settled quickly, enjoying a 6-0 run to get the game underway, but Tolka hit their stride though and quickly had the game level. As Tolka continued to press, Ladmy Sila was the stand out star for Moycullen, keeping his side in contention with some well-taken scores under the boards. Sila kept the momentum going for Moycullen, dominating under the rim and this, coupled with some great work from John Hackett, reduced it to just a four-point game. Tolka’s Matt Treacy and Brian Ashton showed off their skills in style, netting some brilliant scores, but Moycullen’s Eoghan Kelly drove to the net twice off the fast break to put his side straight back into contention. With 10 points between the sides, Sila closed the gap early in the fourth to ensure a thrilling finale for fans. Moycullen showed their character, grit and determination, with James Lyons, Connor Curran and John Hackett all hitting the target. With three minutes to go, just five separated the teams. An Eoghan Kelly lay-up had the crowd on their feet, and with just three points in it, Connor Curran was the hero for Moycullen, bagging a buzzer-beating three-pointer to tie the game and send it to over time. Curran was first off the mark, while a basket from James Lyons gave Moycullen a tenuous lead. Free throws at both ends were followed by a superb score from John Hackett. Although Stephen Canning bagged three free-throws for Tolka, it was Moycullen’s day.